You know an animated film is doing something right when it brings tears to the eyes. Coco may not represent Disney/Pixar at its pinnacle but it's close enough to the top to warrant consideration as the best computer-drawn film of 2017. Of course, competition is slim and little comes from Pixar's summer release, Cars 3, which was crass commercialism at its worst. Coco proves that when not tied to the strings of sequel-making, the writers and animators can do some of their best work. This one movie won't be sufficient to revive a genre that has fallen into a chasm-sized rut but it's as good a start as any. We need more films like this: family-friendly efforts that challenge viewers with ideas rather than regurgitating tired tropes in the name of placating toy companies. Coco takes a deep dip into Mexican culture by setting the movie south of the border on the Dia de Muertos (Day of the Dead), when the spirits of the departed can visit their living relatives. This isn't the first animated film to honor the holiday - Guillermo del Toro's 2014 The Book of Life has already plowed this fertile ground. However, while there are superficial similarities (in the same way that two movies set at Christmas would be expected to share certain images), the plots are divergent. Coco seems to draw more inspiration from Pixar's own Ratatouille and Hayao Miyazaki's Spirited Away than The Book of Life. Director Lee Unkrich brings a rich and respected animated filmography to this project. He was the co-director for Toy Story 2, Monsters Inc., and Finding Nemo. He was then the primary director for Toy Story 3. Without question, he understands how to blend child-appropriate material with mature themes. Toy Story 3 is one of the most successful "works on two levels" films and, although Coco falls short of that achievement, it is strong enough to engage viewers young and old alike. 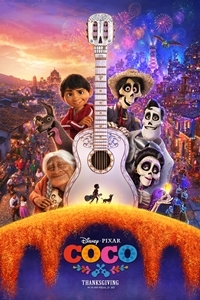 Music is an important aspect of the movie and Coco hits many of the right notes. In the Rivera household, music is banned. The ban dates back several generations, when a woman, Mama Imelda (Alanna Ubach), was abandoned by her musician husband and left to raise her daughter alone. Despite the prohibition imposed by his great-great-grandmother, however, Miguel (Anthony Gonzalez) has a song in his heart and a tune on his lips. Bolstered by the "do whatever is necessary to follow your dream" motto of his idol, Ernesto de la Cruz (Benjamin Bratt), Miguel seeks to prove himself in a talent contest but his unorthodox means of obtaining an instrument catapult him and his dog Dante into the Land of the Dead, where he meets not only Hector (Gael Garcia Bernal), a good-natured con-artist, but many of his forebears, including Mama Imelda. Not being a spirit, Miguel has until dawn to return to the Land of the Living lest he remain trapped forever. But when Mama Imelda offers to send him back, he balks at her condition and instead seeks out Ernesto de la Cruz, with whom he believes he shares a special connection. Putting aside the songs, which are unremarkable, Coco has most of the requisites that make animated movies popular: the (young) protagonist is likeable, the animal sidekick has cute antics, the villain is suitably nasty, and there's heart & soul to the proceedings. Visually, the movie doesn't attempt to top every previous Pixar effort - something that would be difficult considering the studio's output in recent years. A few scenes, such as a panoramic view of The Land of the Dead, "pop" but much of the movie is more interested in emphasizing the Mexican culture than outdoing earlier features. Family, a common theme in Disney movies, is front-and-center in Coco. The narrative focuses on Miguel's desire to find his father, Hector's love for his daughter, and the shared bond that develops between the two. The emotional aspect of the movie is handled with delicacy and just enough manipulation to ensure that even the iciest heart will melt a little. The movie also highlights Dia de Muertos customs and uses them to open a portal into a fantasy world. As in many good animated films, there's plenty of comedy to go along with the occasional doses of pathos. The film also addresses death in a manner that younger viewers may relate to - not as a big, scary end but as a subtle transition to something else. When not pandering exclusively to children, animation can be a wonderful outlet for a filmmaker's creativity, opening vistas that are wider and more expansive than anything found in a live-action production. In its early days, Pixar did this with regularity. In recent years, financial expectations have forced the studio to take commercially secure but not necessarily rewarding avenues. Coco may not be a blockbuster but, regardless of how it performs at the box office, it's a welcome return to a variety of animated fare that prizes inspiration over safety.